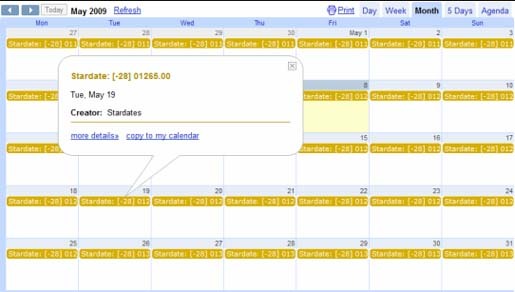 Stardates Lets You Find Absolute Date In Google Calendar ! If you are using the recent event in Google Calendar and that has “how-to-merge-my-multiple-contacts-in-gmail/">Star Trek” means, Google will automatically add a calendar titled “Stardates”. This Stardate is a means of bringing the absolute dates in the fictional Star Trek universe. The information will be in decimal numbers, it will be rounded to a single decimal place, which has the capability to replace the absolute you-can-never-forget-your-friends-birthday-in-orkut/">Gregorian calendar dates. If you want to see thegmail-lets-its-recipients-know-your-address/"> Stardates calendar, you have to create an event that includes “Star Trek” in the title and refresh the Google Calendar. Then you should notice the new calendar in thegoogle-now-offers-real-time-translation/"> left sidebar. 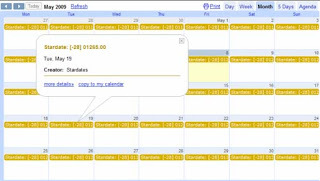 Moreover you can have another chance to look at the calendar is, you have to sign out from Google and then visit sort-tables-in-google-docs-easily/">Google Calendar’s homepage.